If using wooden skewers, place them in water about 20-30 minutes before grilling. In a large bowl, whisk together all marinade ingredients, add sausage and veggies. Preheat grill to medium-high. 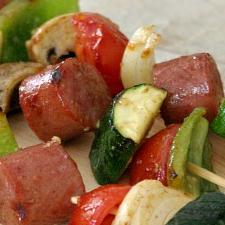 Thread sausage and veggies onto skewers, reserve marinade. Oil grill, place kabobs on grill and cook for 8-10 minutes on medium-high, brushing with reserved marinade and turning once or twice. Per Serving (per kebab): 176 Calories; 7g Fat (36.4% calories from fat); 2g Saturated Fat; 12g Protein; 17g Carbohydrate; 1g Dietary Fiber; 45mg Cholesterol; 832mg Sodium. Exchanges: 0 Grain(Starch); 0 Lean Meat; 1 Vegetable; 0 Fat; 1/2 Other Carbohydrates.